Hosted by the Louisiana Department of Wildlife and Fisheries, CENLA Hunting and Fishing Day took place in Woodworth, Louisiana on Saturday, September 22, 2018. National Hunting and Fishing Day “was created in 1972 by Congress to celebrate the conservation contributions of our nation’s hunters and anglers” . This national celebration is the largest public event for the Louisiana Department of Wildlife and Fisheries which hosts activities at four locations across the state reaching up to 10,000 citizens . At the Woodworth location, there were about 30 activities and exhibits open to the public from 8:00AM to 1:30PM. CWPPRA Outreach staff were set up near the Rapides Wildlife Association, USDA-NRCS, and Boy Scouts of America Troop 49. At the CWPPRA exhibit, visitors had the opportunity to test their knowledge of wetland plants, animals, and benefits with our Wetland Jeopardy game. This event was an opportunity for CWPPRA Outreach to connect with people outside of the coastal parishes. The people in Woodworth welcomed our group and took advantage of CWPPRA materials at the outreach table which included our new vintage-style project posters, Henri Heron’s Activity Book, and recent issues of WaterMarks. Additionally, we handed out a record number of invasive roseau cane scale informational pamphlets to interested outdoors-men. Examples of activities held at other exhibits included pinecone bird feeders, fresh and salt water fish ID, and primitive fire starting. Citizens who had never heard of CWPRPA learned about our mission to construct projects that protect and restore wetlands and barrier islands in coastal Louisiana. 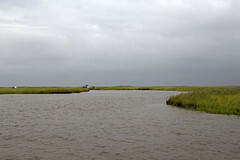 CWPPRA projects may focus on coastal land, but the connections between the Gulf of Mexico, the Mississippi and other rivers in Louisiana also influence our wetlands. existence. Communities depend on wetlands for activities such as hunting, fishing, recreation, or as a source of income. CWPPRA takes a holistic approach to engage citizens of all backgrounds, with the goal of increasing their support for wetland restoration and environmental stewardship. In 2005, the marshes in the North Shore Mapping Unit sustained severe damage due to Hurricane Katrina. Hundreds of acres of emergent marsh within this mapping unit were lost, resulting in hundreds of acres of shallow open water and scour ponds averaging about 2 ft deep. USGS calculated a 1984 to 2016 area loss rate of -0.91 % per year. Currently there is one area along the shoreline that looks as if a breach is forming. This area also has a small pond immediately behind the critical shoreline. If there were a breach in this area it would allow direct connection between the fresher interior marshes and higher salinity waters of Lake Pontchartrain. The overall goal of this project is to restore marshes that were lost and/or damaged due to the effects of Hurricane Katrina. Restoring the marshes should reduce salinity effects on interior emergent marshes. The proposed features of this project consist of filling approximately 384 acres of shallow open water and nourishing an additional 65 acres of fragmented and/or low marsh with material hydraulically dredged from Lake Pontchartrain. Target settled marsh elevation would be +1.2 NAVD 88, but will ultimately correspond to surrounding healthy marsh. This project was approved for Phase I Engineering and Design on February 9th, 2018. This project is on Priority Project List (PPL) 27.